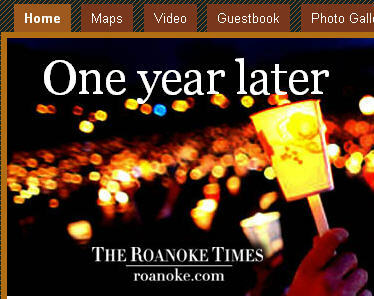 The Roanoke Times marked the one-year anniversary of the Virginia Tech shootings with an extensive multimedia tribute, including “the sights and sounds of the events of April 16, 2008, as captured over a 24-hour period.” The “day in the life” concept is well executed, visually compelling, and deep. It includes video, time-lapse photography, blogs, maps, and reflections from survivors. There’s also a guest book where visitors to the site can add their memories and comments to those that streamed in immediately following the shootings [it now runs over 4,000 pages]. And there’s a link to the archived coverage of the events one year ago and what’s happened since. Take a look at how that coverage is organized into featured sections on wounded victims, deceased victims, investigations, the campus community, reactions and accounts of the shooting. It’s the kind of package any news organization can and should put together online for stories you can anticipate and plan for, like an anniversary. Thanks for the comments. This was the effort of more than 30 journalists from The Roanoke Times who worked feverishly on Wednesday to crank out this multimedia product.